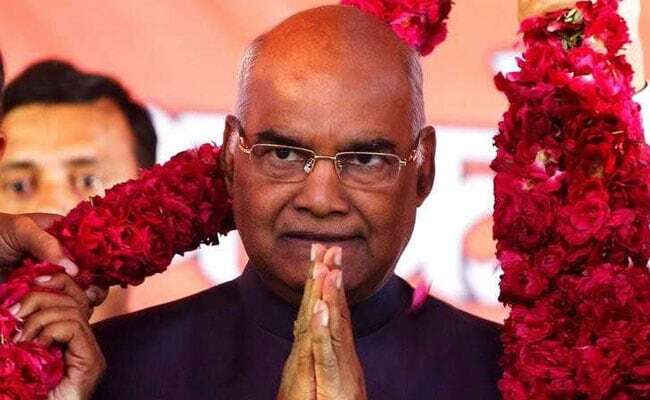 Ram Nath Kovind, the Presidential candidate of the BJP-led National Democratic Alliance, had a clear edge over Meira Kumar as counting of votes continued for the President election. Celebrations have started in Ram Nath Kovind's hometown in Uttar Pradesh. Any attempts at a tune are quickly forgotten as a huge crowd, comprising of youngsters and also some old time friends of Mr Kovind join in, creating quite a noise. The scene of action: a two-room community centre constructed by Mr Kovind at the same place where his parents' hut stood earlier. The community centre is used by one and all in the village. Some distance away, at a primary school that Mr Kovind went to, a Ramayan Katha is on, funded by the entire village, to mark the ascent of one of their own to the highest chair in the country. "Oh our village is going to be on the world map soon... it's because of him. Now there will be better roads, perhaps we may get our own college," said Gauri Shankar Shrivastava, who says he is Mr Kovind's friend. Ram Nath Kovind was picked by the BJP to run for President. About 20 km away, in the Jhinjhak town, Pyarelal Kovind, Ram Nath's eldest brother and his family is estatic. Ram Nath Kovind has four brothers - he is the youngest - and all of them have homes next to each other in the Om Nagar locality of Jhinjhak. There's nothing garishly flashy about the homes, but today, they have jointly decided to splurge and celebrate. And so, a DJ has been summoned, a tent and chairs are in place, and a freestyle dance in progress when we visit. A popular Bhojpuri number suitable for freestyle dances, is on loop and so is a rather bold dance. Inside Pyarelal Kovind's house, the atmosphere is more circumspect. "He will not be a rubber stamp, that much I assure you. He has a mind of his own and he doesn't like too much interference or hand holding," said the 76-year-old Pyarelal, five years older to Ram Nath Kovind. Pyarelal has a small cloth shop in the main market in Jhinjhak town. He opened the shop four decades ago. Before that, he used to run a small cart in a congested bylane in the town. One of the neighbours of Mr Kovind in Jhinjhak is a golgappa seller by the name of Pawan, who runs a cart that does by the name of Pawan Batashe Waala and is very popular in the locality. "I don't know then man personally but the day he is sworn in, I will distribute free golgappas all day," he announced. Till about 2:30 pm, Mr Kovind had scored 1,389 votes with value of 4,79,585 while his opponent Meira Kumar had got 576 votes with value of 2,04,594 after counting in parliament and 11 states. Follow detailed coverage on Presidential Election 2017 here.